You are paying a little extra for the convenience really. Have you seen the price of the 12AH version! Also it weighs 1.2kg. Wouldn't want that on my drill all day! :D Bit a 6AH flex is about 20% bigger and about 20% more expensive. So it's a fair price. Don't have any Hitachi tools but I do hear they are not as good as they were. But I guess that is true of many tools. My dad's Milwaukee tools are indestructible and make modern tools from the big boys look like toys. Dewalt do 18v/54v flex volt battery at 9AH and I think 12AH in the states now . But they are pricey at £129 . But they are so powerful they can run some meaty tools . I was talking about the standard 5AH batteries in the 18v ranges . I don’t rate Hitachi/HiKoki, tools feel cheap . 10-15 years ago they where amazing. So where Panasonic. Where can you grab a 36v DeWalt or Makita for £50? 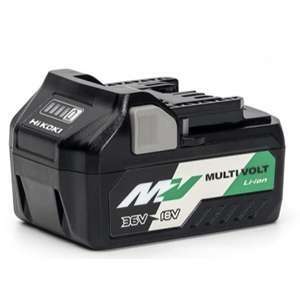 It's a great idea having a dual voltage battery. My 36v battery on my SDS cordless hardly ever gets used. It's just degrading sat in my tool bag. So it’s just 5AH at 18 v and only 2.5AH at 36v . Very expensive for a battery compared to the dewalt and Makita 5AH that you can grab for £49.99 . It is - using Wifi for anything is bad security wise and bad for signal wise! Nothing beats a nice gigabit ethernet although most tellies use a 100mps Broadcom chip! Yes, that's definitely a good TV, specially for £221 . I found only one issue..it doesn't stay connected to WiFi for more than 3, 4 days. I mean, after 3 days, you have to unplug the TV from socket and after that to plug in and to connect it to the wireless again. Or, instead of that, you have to clear the cache/cookies every 3 days and connected it again to the internet. I couldn't find the reason for that, but I'm using fire stick so I don't bother about this. You can find more about this issue Here . I understand at most Hitachi TVs have this issue, many users saying it's because of the internet router. They have put the price up. Such is the power of HUKD, I'm afraid. I have one of these, or at perhaps a previous version. It's a very good, smooth, solid, powerful machine. And the switch is nice, unlike the one on my 4.5" Makita AG which is absolutely awful. I have a Hitachi SDS drill, which has worked flawlessly, and I've now ordered the angle grinder. Hitachi are grappling with the takeover and name change to Hikoki. In the meantime, there are some clear bargains around. Hitachi. Used to be a great brand, now just a badge for Vestel. My "Hitachi" was a disaster, and customer service virtually non existent. Most of the time. Having seen some nasties at their clearance bargains stores I’m always dubious. Nothing wrong with argos refurbished items. I know Pacman, you'd think they would stick with the known name but I suppose we will all get used to Hikoki over time If you don't need a drill with quite as much torque but want a combi drill and driver twin pack with 2 batteries this is pretty good value https://www.toolstoreuk.co.uk/hitachi-kc18dgljb-18v-dv18dds18d-twin-pack-with-2x15ah-batteries/p3338 slightly less power but having a driver on hand can sometimes be a blessing rather than having to swap drill bits for screwdriver bits and at £100 for two decent drills for the average diyer. Pity it isn't a combi drill/impact driver twin pack. hope it helps someone looking for a cheap tv. No Freesat sadly and no USB recording but nice low leccie useage at 71w you rarely see it below 80w but not bad! Depends what has been refurbished - if its the leds i wouldnt touch it with a bargepole. Repack then good deal! Just clamp a straight edge guide to what you are cutting. I once bought a JigSaw thinking it would be handy - I'm sure it's a near impossibility to actually cut a straight line with it. Are you supposed to be able to cut a straight line with one - or are they just for rough cutting edges that are hidden by coving? Not a bad price. I got one December 2017 when screwfix had them on sale for £50. Excellent jigsaw comes with a couple of blades that you can store in the foot. Just in case some don't know Hitachi have rebranded to HiKoki. I guess this is why many of their older stuff is getting knocked out cheaper. Their stuff is ok.
Good deal. Quality SDS drill at £75, great value. My DeWalt is knackered, might have to invest. Happy to help. Figured there might be a code knocking around. Didn't check for cashback though. Might be another few quid saved. The 65" LG is £100 cheaper at John Lewis Sh!te sale price. 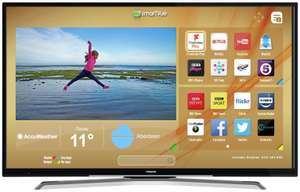 The 55" LG TV is £30 cheaper at Richer Sounds and they give a 6 year guarantee with this TV. Yep, the Hitachi/Hikoki stuff is really good quality. Now it is Hikoki. Hitachi batteries fits new drills but I am not sure that it is working other way. Decent tools anyway. Impressed with this brand, had my Hitachi for over 8 years now and just recently one of batteries went down, would definatelly buy it again! Haven’t they changed the name? 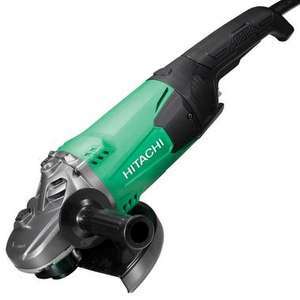 Perhaps the reason why so many decent deals on Hitachi tools at the moment. I got one as I needed a big box, thanks. That's the main point of LEDs, they don't waste energy producing heat, but they produce (about) the same amount of light so they're much more economical to run and if they're run from a battery, they run for a much much longer time. The led bulb costs nearly the same as the unit , so shows either how expensive a bulb is or how much of a bargain this is ;) The led bulb will make the battery last longer , but i doubt if it will give any more light anyway . What? They have different roles, storing large amounts of data on SSDs is not cost efficient. HDD won't be history for a long time. thanks for that and if you read the comments you will find that these are end of life hard drives - replaced just before the warranty runs out and sold to people who don't know better. On amazon they are not described as new, whereas on ebay they are. This is a fraudulent selling. Stay away. second hand, with a million PoH! After reading the reviews on amazon, I'm out. I think it's probably worth paying £20 more and get a brand new toshiba p300 with full warranty from a reputable seller. Hitachi KC18DBFL2/JC 18v 2x3.0Ah Li-ion Brushless Drill and Impact Driver Twin Kit - KC18DBFL2/JC with charger. Not many left but super deal imo. It is professional heavy duty set, brilliant price. New Hikoki batteries works fine. Good drill for light duty but I’m not sure on the price. Had one for a couple of years when Screwfix did a deal for the drill (no driver) with 2 batteries for £100. Unfortunately the chuck has pretty much disintegrated under too much load. Something the B&amp;Q special it replaced after it was stolen never did. Ordered, been looking at the makita and dewalt equivilants and the prices are just crazy. Hitachi or Hikoki, that's the question. Both mine seem fine, no dark spots and have dropped multiple times with no bulbs blown or damage. Not sure why yours would be going dim either; with NiCd batteries the power tapers off towards low charge but with Li-Ion the batteries should go at no noticeable loss of light until they cut out. I get in excess of 30mins off a 1.5Ah. Are you sure it’s not your battery that’s the problem? ive got a hitachi impact. This seems too bulky. Got one and it's really naff. Slightest knock and you blow the bulb. The light spill is unhelpful with a big dark spot in the middle also. Aint even worth the £3.99. Lasts about 30 mins of light before it dims noticabley with a 3ah battery. No, there was two batteries with the drill. You should give up. 4K Ultra HD Certified display resolution. Motion rate 50Hz. Viewing angle 178/178 degrees. Resolution 3840 x 2160 pixels. is it am LED bulb or just old fashioned filament? Are Guild batteries any good for this? I have a 1.3ah 18v Guild battery. I know that some brands among retailers are identical but I could not find anything to say what - Reserved it locally to be sure mind! Just search for the bulb type and add LED to the search. They probably cost a fraction of what I paid now. https://www.ebay.co.uk/itm/Upgrade-Maglite-5W-LED-Bulb-Flashlight-Cree-Conversion-6-24V-Torches-Cell-P13-5S/202269589809?epid=12017080043&amp;hash=item2f18350131:g:DFgAAOSwQVpatS9J It'll be something like this but make sure you get the right one. Mine is good for 100m long beam. Not got the spread of old filament bulb but for me you want to concentrate the light not spread it.